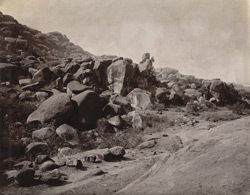 Photograph of a group of boulders and sculptures (too distant to be clearly seen) at Barabar, taken by Joseph David Beglar in 1872-73. In the report of his tours of 1872-73, Beglar wrote, "Down below on the slope of the hill near the road leading up to it are remains of several statues, both detached and sculptured on the rock, some Hindu, some Buddhist; the Brahmanical ones, however, predominate." These sculptures must have been associated with the many rock-cut temples found nearby. The earliest of these have been both architecturally and epigraphically dated to around 250 BC, when the area was ruled by the Mauryan king, Asoka. Asoka was a Buddhist who ruled almost the whole of what we now call India in the third century BC. The earliest caves found in the Barabar hills were used by the Ajivikas, a Jain sect which thrived in the third century BC under Asoka's policy of religious tolerance; it is therefore likely that some of the sculptures depicted are Ajivika also. The sect believed that life was totally predetermined by destiny and practiced asceticism at locations like these caves. The area is also the setting for the opening of E.M. Forster's 'A Passage to India'.